You need! A pound of asparagus (for 4-6 people, assuming pretty small portions since it’s Thanksgiving), a lemon, olive oil, and salt. That’s it! Trim the asparagus and cut the lemon in half. 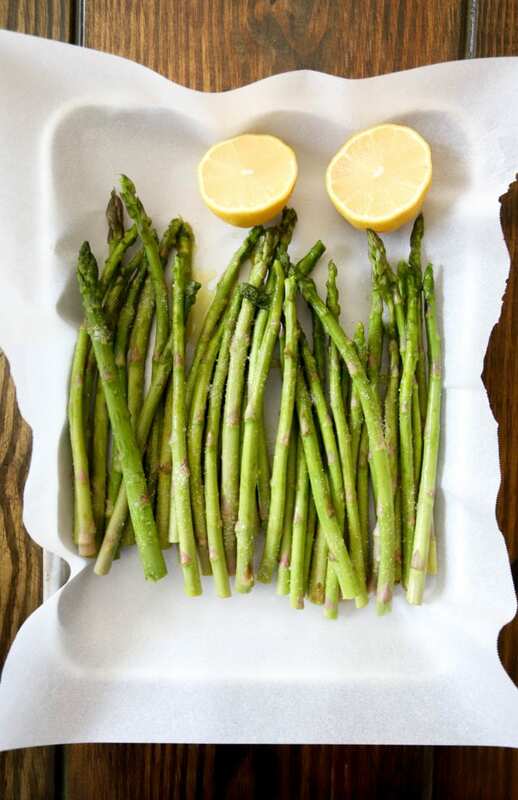 Place the asparagus and the lemon, cut side up, on a baking sheet. 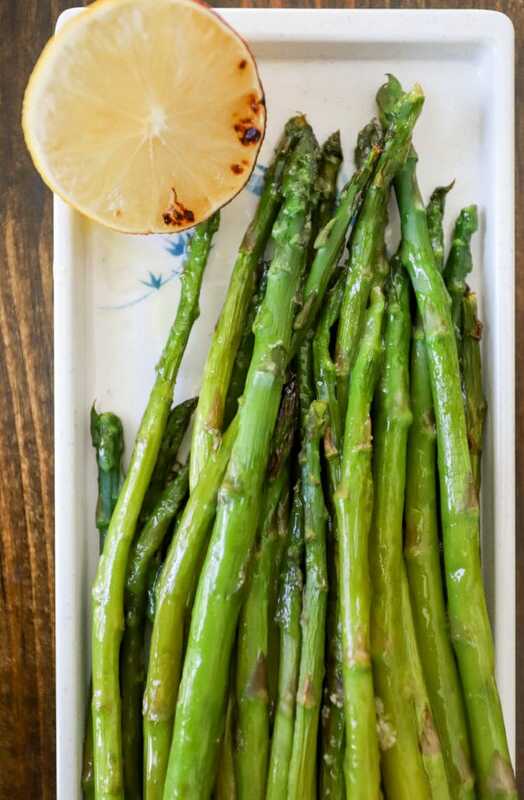 Drizzle the asparagus with olive oil and sprinkle it with salt. Coarse salt is great here, but table salt is fine too if that’s what you have. Right before you’d like to serve, broil the asparagus for 5-7 minutes until it’s bright green in the center and darkened at the edges. I do this in my oven with the rack about 8 inches from the top of the oven, so adjust your cooking time if your rack is placed differently in the oven. 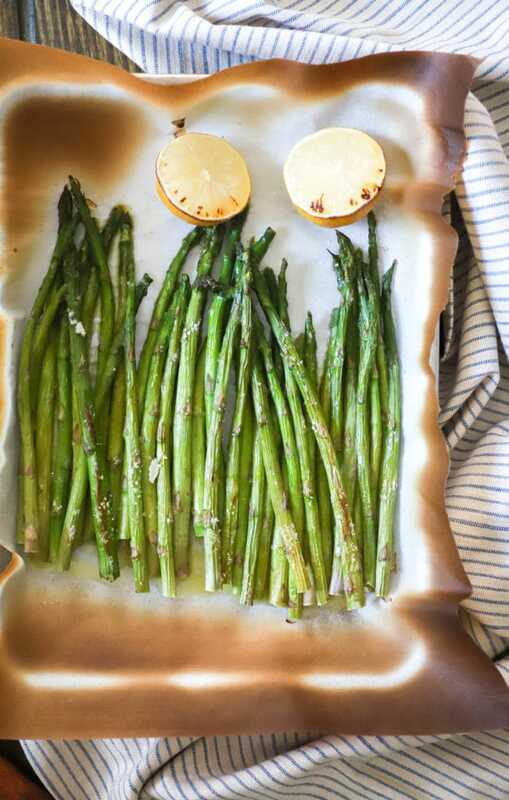 When the asparagus is cooked, spritz the broiled lemon juice over the finished dish, and serve! We LOVE this. It’s perfect for any night of the week, and especially great for a quick “let’s not only eat carbs” addition to your Thanksgiving table, but slightly elevated with the broiled lemon juice added right at the end. The blackened flavor is delicious, the asparagus is perfectly tender + not mushy, and you maybe should definitely make a double batch of this. Perfectly simple and quick asparagus makes the most wonderful light addition to your Thanksgiving plate. Preheat the broiler to high. 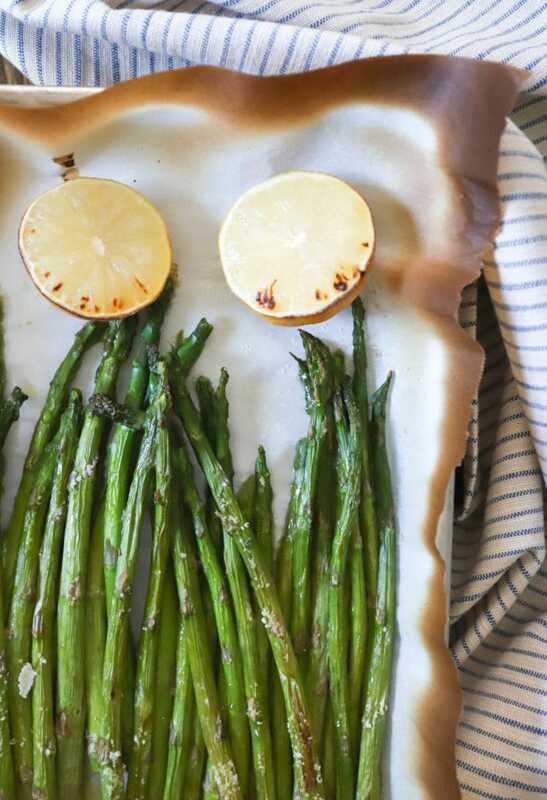 Arrange the asparagus in one layer on a baking sheet. Place the lemon halves cut side up on the same baking sheet. Drizzle the asparagus with the olive oil and sprinkle it with salt. Broil the asparagus for 5-7 minutes with the rack placed about 8 inches below the broiler. Check the asparagus every few minutes and remove when the asparagus is tender and just starting to blacken at the edges. 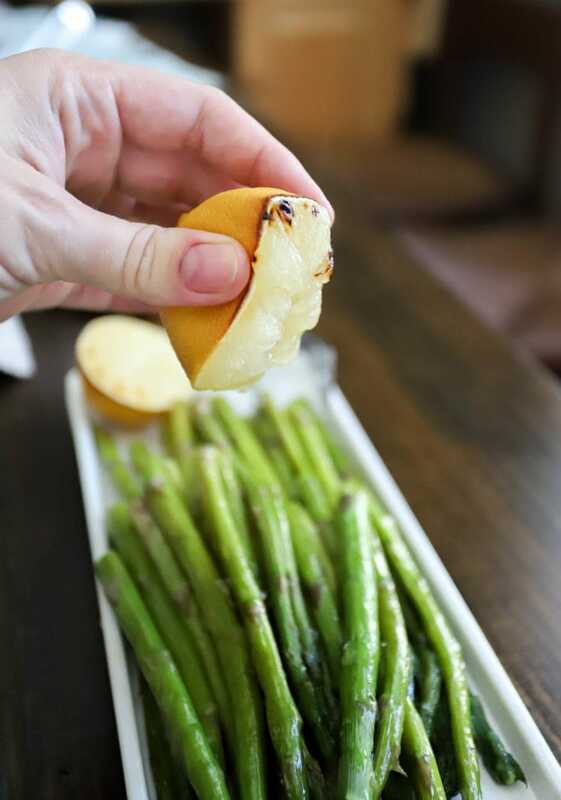 When the asparagus is out of the oven, squeeze the blackened lemon over top (use as much or as little as you'd like!) and serve immediately.